Hello all! I’m sorry I haven’t been around much in the past week, but things have been pretty hectic and I’ve been out of town for a few days. Don’t you hate it when real life gets in the way of all the fun stuff? Anyway, nothing much has happened on the Daredevil front in the past week. In fact, we won’t see much action at all until Daredevil: Reborn #4 comes out and that’s been bumped to May 11 due to various delays in the process (the coloring apparently). Bummer, I know. In the mean time, I’ve been perusing the Marvel Digital Comics database and came across the little gem (not really) I’m about to take a look at right now. I must say, it’s one of the most deliberately tragic Daredevil stories I’ve ever read. 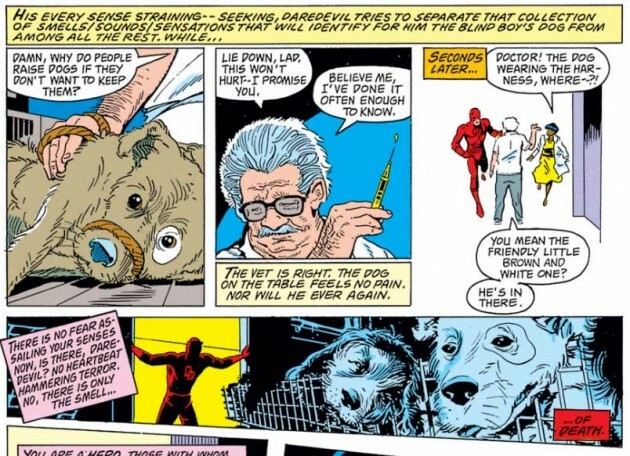 Don’t get me wrong, this isn’t the kind of heart-wrenching tale we’re used to seeing Daredevil at the center of, where his own life is being torn to shreds. This issue, Marvel Fanfare #7, is more a case of an unexpected twist ending. Imagine watching a Lassie movie that’s all fun and games for the whole family until someone randomly shows up and kills Lassie. And, as you’ll see, that analogy really isn’t far off. 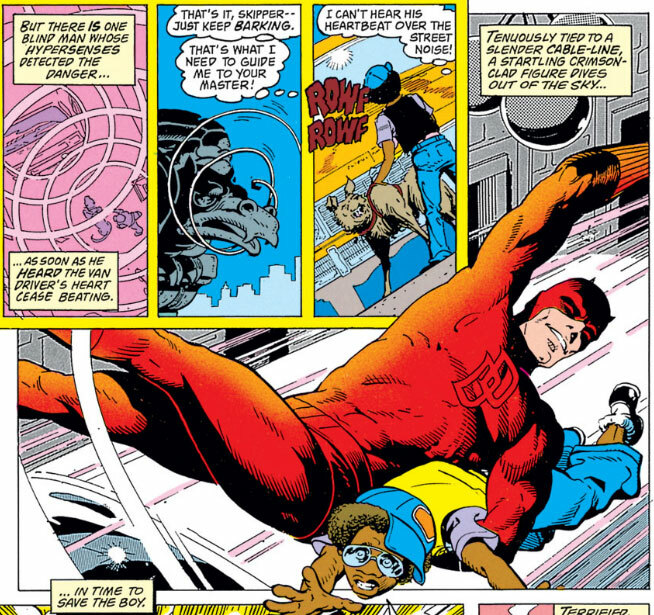 This story, by Bill Mantlo and artist George Freeman starts off with Daredevil saving a young blind boy from being run over by a truck. Really, Matt needs to stop saving blind people from traffic. The first time he did so, it cost him his own sight, and while saving Milla did gain him a wife, she ended up having her mind destroyed by Mr. Fear. As we’ll see, this story doesn’t have a happy ending either. You see, the little blind boy is out with his brand new guide dog for the very first time. The dog, well-trained as it might be, is understandably spooked by the incident and sets off running down the street. Finding this dog becomes Matt’s mission for the rest of this 10 page story, and it turns out to be a trying one. After spending countless hours chasing loose ends, he finally arrives at the pound where he’s met with the fear and desperation of the poor locked-up pooches. Still, as a reader, you’re fairly comfortable that everything will turn out well in the end. Not only did Daredevil more or less promise the boy that he’d get his dog back, we see him pick up the scent of the dog, just in the nick of time – or so one might think. The actual ending had me experiencing a major case of “WTF?”. If you haven’t guessed it already, the dog dies. It’s just been euthanized the moment Daredevil finds it. It’s dead! Talk about an anti-climactic ending. I guess this just goes to show that writers have never been afraid to let Matt fail in any and all domains of his life, but I have to say this defeat really came out of left field for me. Cute Overload in Marvel Ai! Awww … I don’t remember reading this little vignette before but I don’t think I will be in a hurry to read it again either. I’m wondering why someone would be in such a hurry to put down a dog wearing a harness – it is a bit different to putting down a dog wearing a leash, is it not? Not one of Mantlo’s greatest moments, poor bloke. Wow. Very depressing. Feel very bad for the dog. Of course, based on an earlier post of yours, maybe this was in line with Tyrone’s story. DD subtly trying to toughen this blind kid up and make him more like himself. That story was a good unlike what many other think. I was looking for it for ages because heroes that fail does not happen often except in Spiderman or Xmen. That story is more a usual day in the life of DD but this time it ended badly. That story has been utterly misunderstood by its critics. It is a really good and short one. They frigging killed a seeing eye-dog? WHAT THE HECK! major bummer.. i suppose we could find arguments attesting to the merit of the story, but a little blind kid’s dog?,, have gotten into fights over this subject, even in cases like here where we could argue that it lays within the permit of the law (although why such a quick decision and as mentioned obviously not homeless).. but can you imagine, on the outskirts, stumbling on some street punks just about to feed a hungry little stray some burger with crushed glass mixed inside?.. worth it..
it’s inhuman.. we made the dog (and cat).. it’s like a child that needs us.. and the breech of trust is equally gross.. “but they bark.. and senselessly!.. that’s what we made it for..